Whatever you do, follow the blurb’s advice and go into this book not assuming anything. Because I did and oh boy, was I served a serving of “Gotcha” by the end of the book. This book takes suspense to the next level. It will be a while before I read a book that is as good as The Wife Between Us. I sat and read this book within 2-3 hours. It was that good. The book starts off with Vanessa reeling from her divorce. She had been married to Richard for 7 years before the divorce. She is beyond devastated. Richard was her life and she would do anything for him. Vanessa starts stalking the new girlfriend. She is hoping to scare her off from marrying Richard. Or so you think. Nellie is a preschool teacher who meets Richard on an airplane. Nellie is terrified to fly and Richard is there to comfort her during the flight. One thing leads to another and before long, they are dating and engaged to be married. Nellie is plagued by hang-up calls and the feeling that someone is watching her. Nellie has a secret that haunts her and she fears that her secret will ruin any plans of happiness with Richard. I have no words for this book. Honestly, I don’t. I thought I had every figured out but then the author put a twist on the storyline that I didn’t see coming. That changed how I viewed the characters. But then, towards the end, there are two twists that I didn’t see coming. They both took me by surprise. The twist at the end of the book was the one that affected me the most. I couldn’t wrap my head around it. My view of Vanessa was one of pity. She had gone through a rough divorce, was living with her Aunt Charlotte and drinking her life away. She was wallowing in self-pity. I kind of wanted to give her a hug and tell her that everything would be alright. Then the twist came and blew my mind. That changed my view from pity to one of amazement with a touch of “you go girl“. I liked Nellie. I thought she was very sweet. She definitely had her issues. Oh boy, did she but she was working through them. I felt awful when she finally disclosed what happened to her. I also did like that she knew something was off with Richard. I can’t leave much of a review from the middle of the book on because of how much of a mind screw it is. I was not expecting things to happen the way they did. Then I wasn’t expecting the other turn of events. Of course, I couldn’t put the book down. I needed to read this book to the end. And then the two twists that happened there. All I can say is “Wow“. The Wife Between Us is a taut thriller that doesn’t hold back punches. A fast read, I was held captive by the plot. The characters were believable, all of them. The ending blew this book out of the water. Like I said above, it will be a while before I read a book as good as The Wife Between Us. 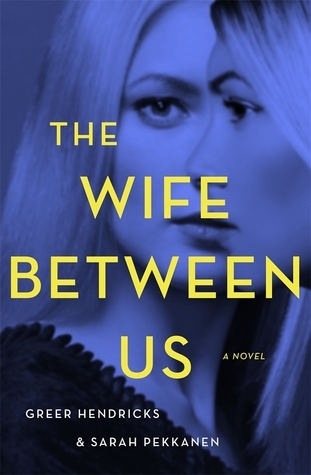 I would like to thank Greer Hendricks, Sarah Pekkanen, St Martin’s Press and NetGalley for allowing me to read and review The Wife Between Us. All opinions stated in this review of The Wife Between Us are mine. Thank you!! It was really good. Really creepy until I figured out what was going on….lol.